If you’re an athlete or coach looking for exercises to help prevent knee injuries, or if you want to add something new and fresh to your warm-up or training session, try these simple exercises with a partner. Each offers a unique training advantage. You’ll increase ligament stability in your knee, including the anterior cruciate ligament (ACL) and medial collateral ligament (MCL), both of which are commonly injured in sports that involve quick changes of direction. You’ll improve eccentric hamstring strength and muscle mass, which will help to protect your ACL and leg muscles during sprints, jumps, and quick decelerations. Whether you’ve had strained or “pulled” muscle previously, or you are focusing on “prehab” for prevention, the following hamstring exercise will be a great addition to your routine. You’ll develop faster footwork, landing mechanics, and body control in a changing environment. If you want to perform better in sports that involve lateral cutting and possibly even body contact, you need to be quick, controlled, aware, and adaptable. 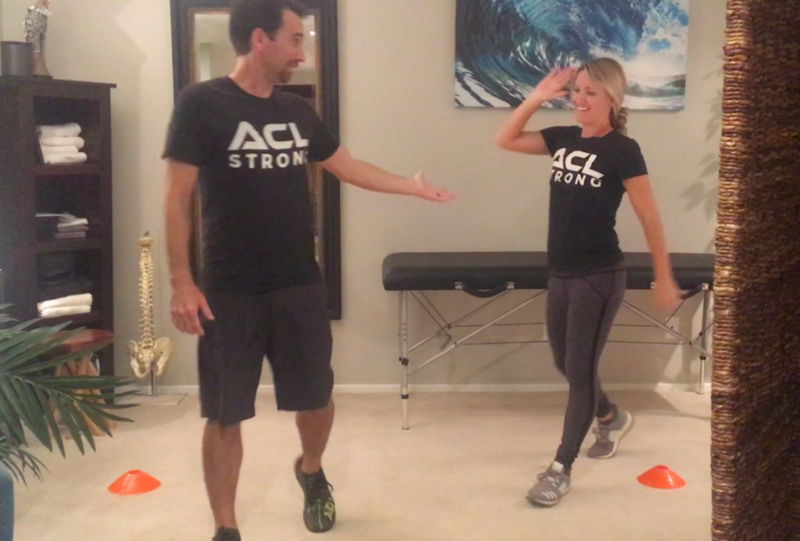 So here you go… 3 fun partner exercises to help prevent knee injuries. As a duo or team, incorporate these into your warm-ups or general conditioning workouts. How to do it: Partner A steps up onto a step with the right foot. As the right knee straightens, the left foot rises and touches down on the top of the step. After just a brief pause, the left foot leads back down as the right knee slowly bends to lower the left foot back to the ground. In this sequence, the right leg is doing a majority of the work. Focus on keeping the right knee centered over the foot, avoiding an inward or outward movement of the knee. Partner B applies gentle, deliberate perturbations to Partner A’s knee in various directions as he goes through the motion of the Step Up/Down. It is important to apply a distinct pressure to challenge your partner, but not to a point of failure or loss of good mechanics. How many: Each partner should do 3 sets of 10 on each foot. Why you should do it: The perturbations apply load to the knee in such a way that the ligaments will adapt and strengthen to become more resistant to abnormal forces. In simpler terms, this helps improve the stability the ACL and lower the risk of injury! How to do it: Partner A kneels on the ground (on a pillow or foam pad for a softer surface) while Partner B secures his lower legs or ankles firmly in place. Partner A begins leaning forward and controls the descent using his hamstring muscles on the backs of the thighs. When you can no longer support your weight with your muscles, return to the starting position. Or, you may fall forward to the ground, catching yourself in a push-up position. Push back to the starting position and repeat the exercise. At first, you may not go very low, and repetitions may be limited to 3-4 times; however, as you continue this exercise, you will gain strength to lower further to the ground with good control. How many: Each partner should do 3 sets of 3-8, or as tolerated. Why you should do it: Eccentric hamstring strengthening improves sports performance and resilience when landing from a jump or decelerating from a sprint, where so many injuries occur. The hamstrings also protect the ACL by limiting anterior translation of the tibia, which is a movement in the knee that can cause the ACL to tear. Well-balance, functional strength throughout the lower extremity, especially the posterior chain such as the hamstrings, is important for minimizing the risk of injury in dynamic sports. How to do it: Partners begin standing side-by-side in an athletic stance. At the same time, they side shuffle away from each other, around a cone (if you have one), and back toward the center. They both hop into the air and gently bump shoulders. Upon landing, focus on a soft landing, bending your knees, lowering your hips back and down, and keeping your chest up in a “ready-position”. Pause briefly to absorb the landing and practice good mechanics. Then side shuffle back around the cone and return to the middle to repeat the exercise. How many: Repeat 3 sets of 5-10 times, then switch sides for starting position so each partner shuffles both directions. Why you should do it: Injuries often happen as a result of landing awkwardly from a jump, whether it’s on the field, court, snowy mountain, or just goofing around. In most sports, especially high-risk sports, your linear body movement can be easily disrupted by another competitor or the terrain. A gentle nudge from your partner during a jump creates a more dynamic landing environment that helps your body learn to adjust for variables in the moment. Have fun with these partner exercises! Coaches, these can be used as part of a dynamic warm-up for your team. Try them out! If you want to play hard without injuries, or if you want to coach your team to victory without setbacks, Click here and get a FREE report on “5 Tips to Prevent ACL Injuries”. To bulletproof your knees and skyrocket your performance starting with a simple 4 week at-home training program, join our ACL Strong tribe of athletes and coaches from all sports around the world, including professional snow-skiers to youth soccer and basketball players, and more. Contact us to find out how to get in and get ACL Strong starting today. Follow us on Facebook for more tips! Podcast: Is Your Athlete At Risk For A Knee Injury?